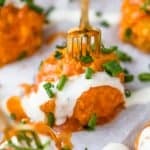 The Ultimate Crock Pot Buffalo Chicken Meatballs – tender meatballs made with ground chicken, celery, carrots and green onion then covered in a spicy buffalo sauce! The lighter healthier version of your favorite buffalo wings! In a large bowl add ground chicken, celery, green onions, garlic, carrot, smoked paprika, salt, pepper, egg and panko. Using your hands mix everything together until combined. Add meatballs to a crock pot, pour buffalo sauce over the meatballs. Using a spoon, gently toss to coat all the meatballs. Remove and drizzle with ranch dressing.